Telling stories to a video camera is a challenge. I have to pretend the lens is an eye and have a conversation with thin air.. The Story of the Dream Gypsies is one I wrote in my early 20’s and then brought back to life recently with a new twist. Some stories are like that, gestating for years in some corner of the imagination. It contains some of the spirit of the Rainbow Gatherings and a love for the road. The Man Who Fell in Love With the Moon is another of my early naive stories. I actually once spent a month making a stop-motion animation of this story with a beautiful doll for the main protagonist, roots for trees, and a piece of cheese suspended on a fishing line for the moon. But then the artist declared she had had a ‘spiritual revolution’ and could no longer support the story – she refused to release the photos. The Character Who Got Away is one of my best stories. The audience never quite knows when the story has begun and as it’s a story about storytelling and the characters in them the whole thing could be a bedtime story for Vladamir Nabokov as a child. This is one of the first darker stories I wrote. It was at a bus station in Morocco in the early hours of the morning while I waited for my connection and it pretty much wrote itself. The box might be addiction or belief or any other device we use to lose ourselves. The fairy was based on a wild but inevitably tragic love affair with a Brazilian girl who changed her mind, if not her name, every five minutes. Another early simple story and this one inspired by a cult comedy from the 80’s called Local Hero. This is one of my heaviest stories and is perhaps not the best one to finish a storytelling session. Unless the storytelling is happening outside and I gesture up at the stars at the end for emphasis. Another magical realist story based on a man I really did see fighting demons in the street one day in Berlin. At least that’s how it looked to this storyteller. Plus it was a fun opportunity to work in some of the graffiti murals that had always inspired me. All stories are influenced by previous storytelling, of course, and the idea of a character walking through the Dreaming owes something to Gaiman’s Sandman series. But it’s a theme that turns up again and again in literature and I love the idea of someone walking through someone else’s dreams. Apart from the provocative hyperbolic title, this story has almost Vedantic overtones or embraces a return to animism. 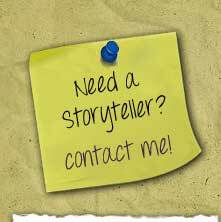 You have licence to become a little grandiose in storytelling. This story is a comic riff on narcissism though it does source some stories of crazy dictators for its core material. There really was a dictator ruling Turkmenistan who changed the names of the days of the week after himself, his mother and the book he wrote, amongst other self-referential names. I had a lot of fun looking for the voices for this story. It’s always a challenge to find new voices for characters and I knew these demons had to have their own awful sound. It’s a slightly more traditional storyline but delightfully wicked in parts. The Story of the Magician is really fun as it messes with your expectations and becomes three different kinds of story all within one tale. After one storytelling session someone lent me a DVD of a film called The Man From Earth, a mediocre film but with its entertaining moments and a similar story. The search for eternal life is an old one but once achieved could death become the Holy Grail? Another magical realist story with strong comic themes. It was fun to write an alternative origin story. A kind of an absurd modern creation myth. Another of the early naive tales. The story of the Wishing Well is one I often tell just to get myself into the mood at a storytelling session before I get into the more complex stories. One of the most pleasing endings though. I wrote this story after spending a month by a lake in Finland and I was hitchhiking up north to Norway. In Finland there’s a culture of silence and so there was absolutely no need to talk on the long journeys and I composed this one watching the endless birch forests pass by. I tend not to use the formulas of traditional storytelling but his one does employ the One Forbidden Thing motif. This love story was inspired by a tale someone told me about their own dysfunctional relationship where they had requested their partner not to come to a party as they couldn’t bear to see others be attracted to them. It seemed to me a fatal indulgence. This is an absurd story that delights in its own daffiness. The story came to me as I contemplated one day what manner of surreal thieves there could exist. Thieves interested in stealing things like privacy, hearts and the meaning of life. This is ostensibly a murder story asking the cliched question whodunnit? But it’s without doubt one of my strangest stories and represented a whole new kind of storytelling for me. Here are some of my latest stories to listen to as you’re falling asleep, on a bus or just in the mood for a bit of imaginative storytelling. All of my stories are true but some of them even actually happened. Here are a few stories I put together from reading interesting books and articles.